I started my career in banking - working at Citibank with its wealthier banking customers. Banking clients typically prefer being anonymous and don't have big personalities like the athletes and entertainers that I represent today. But when I was a Citibank, I learned how to connect with people and clients. Later, I transitioned into a sales and marketing role at the Caribbean Satellite Network (CSN). I was looking for a change and heard about the role at CSN. I applied for it and was hired. It was a great opportunity. Working at CSN allowed me to focus on my core passion - marketing. While at CSN, I also saw how much I loved the entertainment and sports world. Eventually, I started my own company focusing on marketing and branding in sports and entertainment. When I was a kid, I wanted to be a child psychologist. But once I went to college, I learned that I preferred engaging not just children with but with all kinds of people. I discovered that I was more passionate about sales and marketing. I feel like I bring my interest in psychology to the work that I do today. I really enjoy the psychology of marketing and branding, being able to relate to people, and finding ways to connect with consumers on an emotional level. I get excited when I get to build a brand, see it go global, and connect with fans like I did with Usain Bolt's brand. When I started my company, I did marketing for Martin Lawrence's TV show Martin. Since then, I've worked very hard to build my business and bring value to clients like Usain Bolt. I've grown Usain's global brand and landed unprecedented lucrative marketing deals in a sport that often goes unnoticed - track and field. Also, I've worked with CEOs and C-Suite level executives at Fortune 500 companies helping them with their branding and securing book deals. I represent NFL players like Olivier Vernon who played for the Miami Dolphins and is now with the New York Giants, and Joe Haden with the Cleveland Browns. I also worked with basketball player Kevin Durant's mother Wanda in connection with the Lifetime movie The Real MVP: The Wanda Durant Story. And I've worked with Peter Miller who has a fishing show on NBC Sports called Bass 2 Billfish. I have a broad range of clients. Without a doubt, working with Usain Bolt has had the biggest impact on my career. I started working with him when no one knew who he was - right before the 2008 Beijing Olympics. Once he won gold medals and broke world records in Beijing, people questioned whether he could repeat his success. Many thought he would be a one hit wonder and couldn't sweep gold medals at the World Championships or in the next Olympics. From the beginning, I believed in him. He works hard, and he's marketable. He has charisma, and a great personality to expose to the world and his fans. He's one of the best athletes of all time, and has proven this by winning gold medal after gold medal in 2012 and again in 2016. But when we started out, securing endorsement deals for Usain wasn't easy. I had to work very hard to get sponsors for him. I got Usain his first big deal - it was with Gatorade. It was hard to land and negotiate since Gatorade mostly sponsors American athletes. Plus, track and field isn't as popular as football, basketball, or baseball. Very few track athletes make any money in their sport, and very few can translate wins on the field into marketing deals and money in the bank. With Gatorade, I had to convince them of Usain's brand value and that he'd repeat his athletic success. Once he continued to win, we proved he was a solid investment. Then, there was a domino effect when he kept winning and breaking records. I was able to get him bigger and better deals, and to renegotiate better terms for early sponsorships like Usain's Gatorade partnership. I initially connected with Usain and his team through my network. The relationship was brought to me by Jamaica's Deputy Minister of Tourism, who I knew since I'm Jamaican and started building a name for myself. He told me about a young Jamaican athlete who had great promise for the Beijing Olympics - saying the athlete needed representation. He wanted me to meet Norman Peart, Usain's business manager. We started talking and they interviewed me. I met Norman and Usain, and joined their team. When I started negotiating endorsement deals for Usain, they started out in the hundred-thousand-dollar range. Now, Usain has multi-million dollar and multi-year deals. No other athlete globally has more endorsement deals than Usain Bolt. Through working with him, this has enabled me to get more clients since others see what I've done and how I've delivered. It's been challenging being a woman in a man's world and in an industry dominated by men. I've had to prove myself. But when Usain's record-shattering wins exploded onto the world stage - with his name, logo, and brand known globally - it became easier as the only female on his team and one of a handful of women in sports. 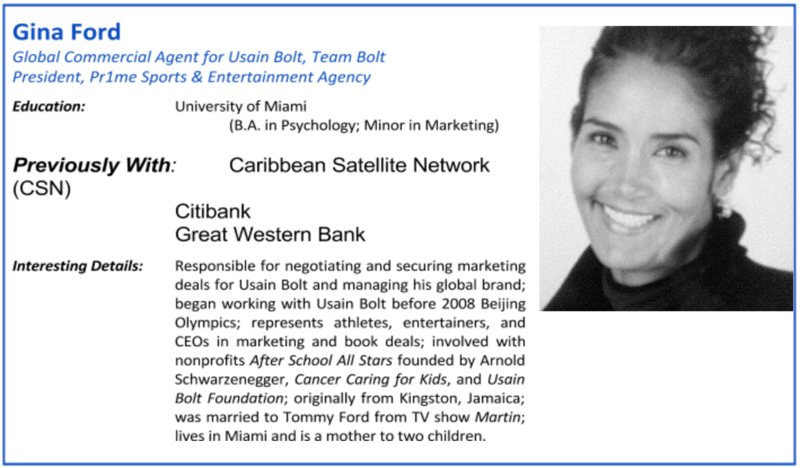 Normally, someone like Usain goes to a big sports agency like CAA, Octagon, or WME-IMG. They don't come to boutique agencies. Usain is one of the few major athletes who's not with a large firm. So why me? Why my company? It's because Usain sees the value that I bring. He's happy. I bring him great deals - like the Nissan G-TR car endorsement deal worth millions of dollars where I negotiated the partnership and collaborated to build the marketing plan. I believe the success of my clients speaks for itself - including being able to overcome obstacles along the way. I have a lot of perseverance. I don't take "no" for an answer. I have a strong work ethic, and I have a personality that allows me to work well with others to get the job done. I'm outgoing, I smile a lot, and I'm personable. People often have a hard time saying no to me. How I approach things also makes me more effective. When I walk into a room, I exude confidence and can be a commanding presence. If I set my mind to something, I always believe I can do it. And as a team member, I'm always willing to help anyone on the team. We're in it together. But my effectiveness really boils down to my personality. I'm easy to work with and am goal oriented. None of the deals that I negotiate are easy. They can take years to develop and finalize. I mentioned before the deal with Gatorade, which is owned by Pepsi. It was hard selling what was then a no-name athlete in a less popular sport. Finalizing a deal with Gatorade took a lot of convincing and diligently selling the promise of Usain's name and brand. They don't sign just anyone. Now we've been with Gatorade for 10 years - it's a multi-million dollar deal that keeps increasing over time. Recently, we closed a deal with G. H. Mumm in France, which is one of the largest champagne producers in the world. It's owned by Pernod Ricard - one of the biggest spirits and liquor companies in the world. It went into effect this year, and took six months to negotiate. We had a lot of meetings with them - convincing them why they should sign with Usain. Historically, they've endorsed Formula One auto racing. It was a departure for them to partner with one person and a track athlete. We shared a lot of data and statistics in our discussions. I thought the Mumm deal wouldn't happen given how in-depth their due diligence process was as they evaluated his degree of marketability. I'm pleased we were able to negotiate a deal with Mumm in the end. Usain is going to have his own champagne, and the deal is worth millions of dollars. Collectively, Usain's deals are worth tens of millions of dollars annually. He gets "NBA money" in a sport where people only make a few thousand dollars. But none of these deals were or are simple to negotiate. They all have their own challenges. It's just that now people know who Usain is and he's known around the world. I believe my own negotiation style helps my success in securing endorsement deals. I don't have a pompous attitude. I see the value in my clients, and my goal is to sell my client's brand value at the highest level possible. It also helps that many of these companies want partnerships with someone like Usain Bolt, so I have more leverage and bargaining power. I have a diverse background, and it helps me when interacting with all kinds of people. I'm Jamaican - part black, Portuguese, and Chinese. I see myself as mixed and as a minority. And I've never let race, color, gender, or class stop me. I come from an island with a multi-ethic background and culture. When I walk into a room, I don't feel held back. I feel confident in who I am and what I can accomplish. I walk in with the right level of executive presence. I never feel intimidated walking into a room full of men, or into a board room with few women and minorities. I guess I have approached my career with a certain level of fearlessness, and it's allowed me to be successful. I'm proud of many things in my life. I'm most proud of landing Usain Bolt as my client and what I've been able to accomplish for his brand. I've been able to take him to where he is today where so many companies want to sign with him, which isn't where we started out. I'm also proud of what I've done for my other clients - like being a co-executive producer on the Wanda Durant movie that was on the Lifetime channel last year. I'm very proud of having come from a small country, immigrating to the United States, making a name for myself in sports, and becoming a successful marketing agent in a male-dominated profession. I believe my success lies in stability. I didn't jump around from job to job during my career. I've been very stable. I've remained focused, capitalized on what I've learned each step along the way, and taken the skills and knowledge I've developed to propel myself to the next level. And I've been able to be successful for many years in sports and entertainment as a business owner where I have more control over my career and future.